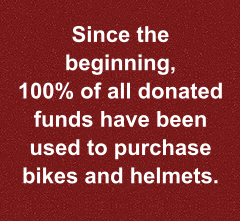 This past year The Spokes Group continued its success in providing bikes and helmets to children at Christmas time. Bikes provide for independence, healthy activity and more benefits for youth. Thanks to all of our partners and supporters we finished the year with a modest cash surplus.